Cloud Enterprises Publishing, 9780997424607, 31pp. Have you seen what the magic clouds can do? The Magic in Clouds is a fresh and unique new addition to children’s books. The book utilizes actual untouched photos of clouds that have morphed and formed into a myriad of recognizable shapes in combination with whimsical illustrations and engaging, lyrical verse. “Magic” is intended to fire children’s imagination by opening their minds to the limitless possibilities nature, here in the form of clouds, can provide. The Magic in Clouds transports the reader to a seemingly endless variety of locales in search of new magic being created by the clouds. From a city block to the North Pole to the jungles of Africa, see if you can discover what the clouds have formed in the sky as you let your imagination soar among and with the clouds. The child can take the book outside to uncover new magic and continue to play it with family, friends, or by themselves, anywhere clouds are found gathering. The fun is in the discovery and the creativity each reader brings to the experience. It is simply magical! Joan Scala is a nature (and cloud) enthusiast and award winning photographer. She is passionate about igniting the imagination of children in order to open their minds to all of the possibilities nature can provide. Joan especially enjoys introducing young minds to the endless adventures the world can present by looking beyond the obvious and engaging the creative parts of children’s minds. She feels with imagination, anything is possible. 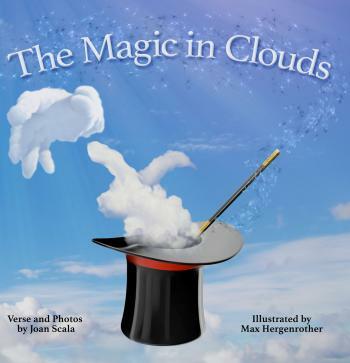 The Magic in Clouds is first in a series of children’s books to be created by Joan Scala. In addition to the second in this series, Joan has numerous additional projects underway. Max Hergenrother is a New York based artist who received his MFA from School of Visual Arts in 2005; since then he has been working as a professional Illustrator represented by The July Group. He is also an Associate Adjunct Professor at St. John’s University and is the owner of CTIArt art school in Glen Cove, NY. Max has works in children’s literature, book jacket design, web design, dvd authoring, multimedia design, as well as trade books and advertising. Max’s illustration and fine art have appeared in Annova Books, Batsford Publishing, Farrar, Straus and Giroux, Kappa Publishing, Macmillan, Reed Business, Nassau County Museum of Art, NetConnect Magazine, New York Times, Newsday, Penguin Books, Wading River Books, Sleeping Dog Studios, and others.